Every car or motorcycle battery in the world needs a quality battery tender, be it lead acid, AGM or gel. Why is that? Keeping your battery in tip-top condition is vital for you to exceed the use by date, on your motorcycle or car battery. This puts more money in your pocket, to buy mods and upgrades for your pride and joy. As we needed a new battery tender for our Harley Davidson 2007 FXSTC custom Softail, due to the battery failing. We decided to review the top 2 new battery tender chargers on the market for 2017. The best battery tender for Harley Davidson ended up being the NOCO Genius G3500 smart battery tender. Read on for how we came to that conclusion. Lets check out their features and specifications. There has been a lot of advancement in the way lead-acid batteries are charged. In the good old day’s battery, fast chargers would just pump in some amps, and your battery would boil away. The side effect to this is you slowly run out of battery acid and dry up the cell. Destroying the battery in the process. Now you’re up for a new battery and having to jump start your bike until you do. Quality Motorcycle Battery tenders came to the rescue with a multi step process which works something like this. STEP 1 DESULPHATION: Detects sulfated batteries. Will try to repair the battery by pulsing current and voltage, this removes sulphate from the lead plates of the battery in-turn restoring the battery capacity. STEP 2 SOFT START: Slowly ramps up current and voltage, this tests if the battery can accept the charge. This step prevents charging with a defect battery. STEP 3 BULK: Charges with a maximum current of the tender, until approximately 80% battery capacity. STEP 4 ABSORPTION: Charges with declining current to maximize 100% of the battery capacity. STEP 5 ANALYSE: Tests if your battery can hold a charge. Batteries that can not hold a charge over a short time will need to be replaced. STEP 6 RECONDITION: This is user selected and during the reconditioning step, the voltage increases to create controlled gassing in the battery. Gasing mixes the battery acid and gives back energy to the battery. Doing this a few times a year can help the longevity of your battery. STEP 7 FLOAT: Maintaining the battery voltage at maximum level 100%, by providing a constant tender voltage charge. STEP 8 PULSE: Maintaining the battery at 95–100% capacity. The tender trickle charger monitors the battery voltage and gives a short pulse whenever necessary to keep the battery fully charged. The top two multi-step battery smart fast chargers currently on the market are the Ctek and the NOCO. These two manufacturers are the main players in the Battery Tender market. Each Ctek vs Noco brand have multiple trickle chargers, to suit different ranges of batteries. From Jet-skis, like Sea-doo and Yamaha, ATVs, Harley Davidson Motorcycles, and 4x4s. 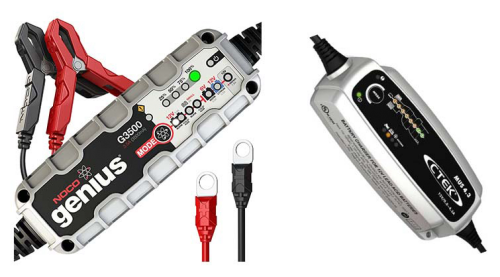 The two mid-range models that can do just about everything at a great price are the Ctek MUS4.3 and the Noco G3500. The only real difference is the Noco G3500 can do 6v and 12v charging, whereas the Ctek Mus4.3 can only do the 12v charging. Not a game changer if you don’t have any 6v batteries. Smaller 6 volt SLA batteries will be in things like auto/self-start lawnmowers and smaller motorcycles. 2. Connect the battery tender black clamp to a bare frame or engine bolt, away from the fuel hose. 4. Turn off power to the Battery Tender and disconnect the trickle charger from the wall socket. You can now disconnect the battery. 5. Disconnect the Harley Davidson battery tender black clamp before the red clamp. The NOCO G3500 directly supports CANbus charging on Harley Davidson’s. So what is Canbus? Well, it is the electrical systems found on some Harley-Davidson motorcycles and many other vehicles and motorbikes. It is a protocol that sends and receives information like speed, temperature, steering angles, tilt sensors, pressure, user input and many other sensors to improve the engine fuel economy and overall user experience. Making for a safer and more technology driven experience. If you use a standard battery tender for your Harley Davidson Motorcycle, you will soon realize that the 12-volt charging port is disabled when the ignition is off. Recharging requires the ignition to be on, or direct connection to the battery. Keeping the Ignition on is crazy unless your motorcycle is in a locked up fortification. 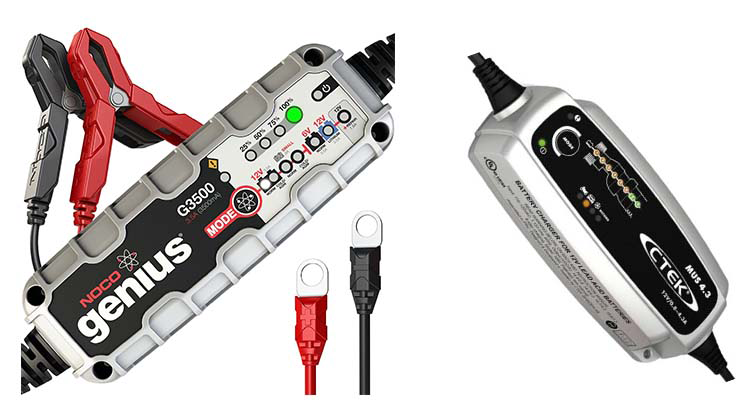 With CANbus enabled technology, the Noco g3500 charger sends a special voltage signal, that automatically opens a relay and allows charging through the 12-volt accessory port. Nice. NOCO have been around for a while as an innovation company. They have many battery related products like lithium-ion jump starters and top-rated smart battery tenders. 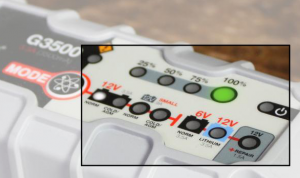 The NOCO G3500 battery charger is a dual voltage charger that has the ability to charge 6v and 12v motorcycle batteries, lawn mowers, Jet Skis, ATVs, boats, sports cars and four-wheel drives. A very new feature is the ability to charge 12v Lithium Ion batteries which are starting to come out to market. Streamlined design that’s ultra-compact, portable and incredibly lightweight. It features external mounting holes and a rubberized base that avoids surface slipping and scratches, all while remaining impact, UV and water-resistant (IP65). Able to be safely connected 24/7. It monitors battery activity for safe and efficient charging, automatically minimizes energy consumption, and includes spark-proof technology, as well as reverse polarity and overcharge protection. This will be indicated by a problem status LED that will light up, alerting you to an issue. Intuitive LED indicators to provide visual state-of-charge feedback and diagnostic information, even when in maintenance mode. NOCO G3500 Charging Modes Explained. For charging 12-volt lithium-ion batteries, including lithium iron phosphate. When selected, by pressing the mode button, a blue LED light will illuminate. Max 14.2V at 3.5A Up To 120Ah Batteries. A smart advanced battery recovery mode 7 step, for repairing and storing, old, idle, damaged, or sulfated batteries. When selected, by pressing the mode button a red LED will illuminate and flash. Higher Voltage 16.5V @ 1.5A Any Capacity no limit. In Standby mode, the battery tender is not charging or providing any power to the battery until required. Energy Save is activated during this mode, only a small amount of power is required from the electrical outlet to power the Noco g3500 unit. When selected, by pressing the mode button, an orange LED will illuminate. The Noco g3500 mid range battery tender is a very well-built charger. It feels very well made and has a nice solid heavy weight to it. It is able to fully charge drained lead-acid and lithium-ion batteries up to 120Ah, (can go higher just turn off then on again) including ATVs, lawn mowers, motorcycles like Harley Davidson, Ducati and most important cars. Safely maintain all types of automotive, marine, RV, power-sport, lawn & garden and deep-cycle batteries. The new Noco G3500 has new technology which delivers superior performance. Charge, repair damaged batteries and being able to be used with micro-hybrid start-stop vehicles and CANBUS electrical systems. As its ultra-compact, portable and incredibly lightweight. It can easily be able to be stored in your glove box when needed. Furthermore, it features external mounting holes so you can mount it in your shed, on a trolley or even in your car or boat. The rubberized base makes sure it won’t slip around. Impact, UV and water-resistant (IP65). LED multi-colored lights provide visual battery tender feedback and diagnostic information, even when in maintenance mode. NOCO Genius Smart Battery Chargers are some of the safest and most advanced on the market. Designed for use on 120-volt 50-60Hz electrical systems, the G3500 includes both X-Connect battery clamps and permanently mounted eyelet terminals. If you hard wire the Harley Davidson battery tender pigtail it will make charging simple. An added bonus was the 10 amp inline fuse connected to the Eyelet cable, as well as a 10 amp fuse in the battery clamp connector. A 5-year limited warranty was nice to see. The best Harley Davidson battery tender at the cheapest price. The excellent Ctek mus 4.3 is the latest mid-range battery tender that provides a great deal for the money. There are many examples of people getting massively extended run times before failure of their car batteries, because of using smart battery tenders. IF you can keep your SLA or Gel battery fully charged at all times you can get 6 years + out of your battery. Without a battery tender, you will be lucky to get 3 years. Auto charging and maintenance in 8 steps to maximize your battery life. Full safety features like no spark, short-circuit proof and reverse polarity protected makes it one of the safer battery tenders on the market. Many accessories like longer charge lead, permanent eyelet charge leads and quick disconnect clamps. This simplifies using the same charger for multiple battery applications. I like that there are inline fuses to the clams and the eyelet cables. Just like the NOCO g3500. Great to see, safety is important. Who needs a Battery Tender? The CTEK MUS 4.3 battery charger is perfect for those who want a no-fuss charger that can be set and forget. Especially for those with a Harley Davidson motorcycle or Jet-Ski which usually sits idle in the off-season. Your vehicles are having a constant drain on the battery through security systems, therefore you really need to keep topping up the battery every month or so. The Ctek mus 4.3 can solve a broad range of battery-related problems like, low cranking amps and batteries that don’t hold a charge. The Mus 4.3 can bring those batteries back to life. It features 8 step charging to maximise battery life and performance. So how does this 8 step battery tender charge work? Well similar to the Noco charger, the key features are a de-sulphation process which removes sulfate from the lead plates. The smart battery diagnosis will show if a battery can take and retain a charge, a special reconditioning procedure that restores sulfide and deeply discharged batteries. Special maintenance charging, a mode for optimized charging during really cold days, and charging of my favorite the AGM battery. The color-changing LED display allows the user to see the overall charging process steps. It’s a wise choice battery tender for Harley Davidson Motorcycle, providing you have easy access to your battery. Included with the MUS 4.3 are the charging unit, 2 battery clamps, a Comfort Connect M6 (6mm) eyelets, and a mesh storage bag. With a huge range of optional accessories, the charger can to used to charge all your battery needs, with a simple quick plug-in connector. I really like this feature as I can keep the eyelets or crimp ring pigtail connected to the hard to reach batteries of my Harley Davidson and Sea-doo. The MUS 4.3 battery charger has a 5-year Limited warranty likewise so does the NOCO unit. At the end of the day you cant go wrong with either of these 2 battery tenders for your Harley Davidson motorcycle. 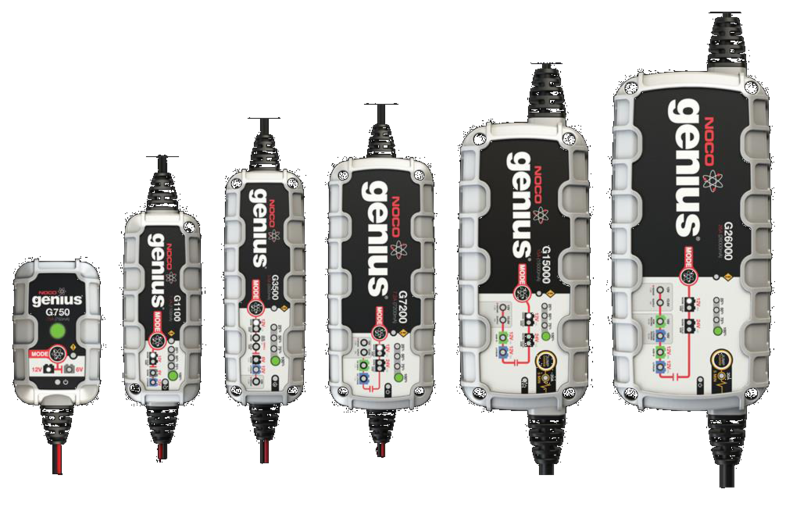 The Noco G3500 is clearly the winner, with added features like 6v charging and CANbus support. If you decide you don’t need these options, it still may be good to future proof your charger. The top-rated Noco Genius G3500 is currently the best value smart trickle charger on the market. Don’t waste your money-getting a non-smart battery tender, which may destroy your expensive HDX30L Harley Davidson or Victory motorcycle battery over time. It’s not worth the risk. If you don’t ride for a month, your battery is at risk of a slow death. Then your battery gets too low in volts, you are up for either a new battery if it won’t take a charge or a Lithium Ion Jump starter. Get it connected to a tender now. Your wallet will thank you. 3.5 and 4.3 amps is IMO too much for most motorcycles. I have a Noco Genius G3500 hooked up to my Harley but it has a 26 amp battery, and I wouldn’t even consider using the 4.3 amp CTEK for any motorcycle.. The benefit of these smart chargers is that they can support small motorcycle batteries, or the larger car batteries. When selecting small battery charging the Ctek will charge at 0.8 amps, this smaller charge rate is perfect for motorbikes. The other option is 4.3 amps for when charging a car battery. You have many options with just a press of a button. That why the Noco and Ctek chargers are so well regarded. Thanks, I wasn’t aware of the lower charging rate. I’ll have to look into the CTEK. One would want to make sure they used the lower voltage when charging small batteries.